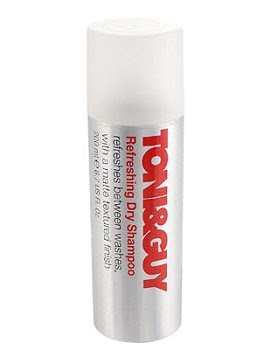 This is a review of Toni & Guy's Refreshing Dry Shampoo. I have very irritating hair that I have to wash almost every day or it looks greasy - not fun. I am always on the look out for something that will sort my hair out, and I was absolutely delighted to find this little bad boy!! The directions are simply written on the bottle - shake can well, hold about 20cm from your hair and spray liberally. It also suggests concentrating on the roots, as this is the greasiest part of your hair. I really liked this product but I did have to use quite a lot of it to get a desirable effect (my hair was really greasy though, I left it for two and a half days to test this out!!). For the amount that I used, I think this was pretty costly - I can't remember the exact cost, but it was in the range of €8-10, I believe. The smell of this particular dry shampoo is quite like other Toni & Guy hair products - it reminds me of going to the hair dresser, and I love that feeling!! I have tried other dry shampoos and the smell was a total turn off, so this was a big bonus. Another great bonus of this shampoo is the finish it leaves on your hair. I have dark hair, and often the white colour of dry shampoos gives my hair a nasty, grey-ish tint which is NOT nice. This dry shampoo, though white in colour, does not tint your hair in any way. Stocktogo is a leading online retailer of hair care products and Toni and Guy Products in UK. Call at 0121-5544826 for toni and guy prices.